Welcome to our new website! I hope you like it and will enjoy browsing through our pages. 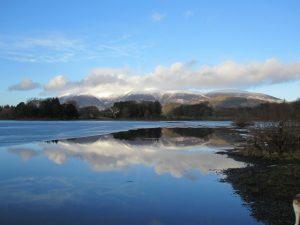 If Loweswater is new to you and you are thinking about coming here on holiday I hope our website is whetting your appetite! If you are old friends, it’s lovely to have you visiting and hope you like what we are doing. Many people say coming here is like coming home and I understand what they mean. Guests often ask what it is like to live here or what it is like in different seasons, so I thought having the new website could be a great opportunity to share some thoughts and pictures with you. Never thought I would have a blog! It is usually very quiet at the beginning of the year here and there are not many people about unless there is really good weather at a weekend. Keswick has been deserted (!) and when you walk round the Heads, there are builders and decorators vans busy at many of the B&Bs. For me also, it is an opportunity to do any work that needs to be done in the cottages, checking through everything, renewing worn equipment, etc. All the bedding goes to the laundry in January and I always think it becomes a bit like those competitions where people try to see how many of whatever you can get into a mini only in my case it is how many duvets and pillows I can get in a Golf and still safely see to drive! I had our annual VisitEngland inspection at the end of January so this year most things had to be done by then. The inspector, who had not been to the Cottages before, gave us a very professional and thorough inspection and said all the cottages were all very well maintained and cared for: they were immaculate (we scored 100% on cleanliness) and all three retained their Five Star rating with Gold Accolade. Phew! Life hasn’t all been cleaning, repairing and replacing and I have taken opportunities to get out and walk. There have been some glorious days, but also some very wet ones! 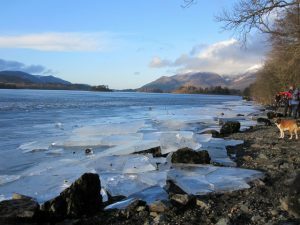 There was a magical Sunday in January when I was walking along the shore of Derwentwater: the sun was shining, the sky was blue and the lake was frozen; all round the edge there were large slabs of ice creating amazing ice sculptures. 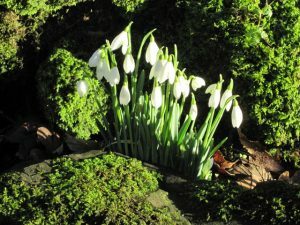 The snowdrops have been lovely this year, there are lots along the Thackthwaite road and there is an amazing bank of them by the top entrance to Lanthwaite Wood at Scale Hill. The birds have started singing and it is making it all feel quite spring-like. I started off by wondering what I was going to write but seem to have written quite a lot so I will finish here for now. Before I sign off I just want to say thank you to Paul, one of my sons, who has built the website based on a design by Matude. He may be a familiar face to some of you: he is usually to be seen, when he is here, hosing down very dirty bikes in the courtyard. Thank you Paul!